Do you ever think about losing your child? For the last few months, Julie and I have been following the story of Eva Markvoort. 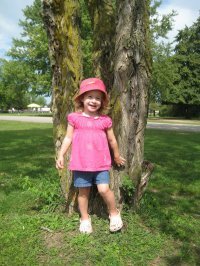 Eva has been a courageous and energetic CF patient with an infectious sense of hope. We’ve clung to the hope that Eva would succeed against the odds and triumph over the same disease that our daughter Katie has. The last few weeks have been tough to watch as Eva’s health deteriorated. The finality of her death this past weekend was a reminder to us that our daughter suffers from a disease with no known cure and a cruelly short life span (less than 40 years of age) for over 50% of CF patients. Seeing someone die from this disease at the age of 25, when that person should be living life, growing a career, getting married, having children, seems horrific to any parent. For many, the thought of a parent burying a child is unthought of. It’s supposed to be the other way around. Parent’s aren’t supposed to outlive their children. For those parents that do lose a child, it can be sudden, catastrophic and devastating. Car crashes, accidents, violence and suicide can come from nowhere and cripple an entire family with grief. There is no time to prepare. No time to say goodbye. No time to think of what if. But for us, we understand the freight train that is heading towards us. We know what cystic fibrosis does to the body. We know that it relentlessly eats away at healthy lung tissue, leaving scarred and damaged lungs that can’t process oxygen. They starve the cf patient of air, leaving them unable to breathe. CF patients deal with daily treatments to help fight off the effects of disease. Julie and I work daily on Katie’s body, doing our best to keep her healthy and to keep infection at bay. We fear for the future. But, we’ve learned that we have to live in denial about what the future holds. We deny that CF will get the best of Katie. We hope that she’s one of the lucky ones – the ones that surpass the average life expectancy. We hope. We pray. We push that fear to the far corners of our minds. Eva’s situation has reminded us of the gravity of the situation that we face with Katie. Odds are that we will outlive her. Unless something changes. And that something needs to happen sooner rather than later. We can’t wait until Katie is horribly sick with disease to start fighting for a cure. We need to act now, while she has her youth and her health and her vibrant, bubbly nature. We need to do the heavy lifting now to help find a cure BEFORE Katie needs it so that it is available, tested, proven and reliable when she needs it. Research looks promising. But I don’t see a cure yet. And I don’t want to wait until Katie desperately needs a cure before we start looking. I’m fighting now to help find a cure so that when Katie needs it, it’ll be there. Put yourself in our shoes… What would you do if you knew that something was going to prematurely take the life of your child? Would you wait until that time came to start fighting? Or would you work now to prevent ht from happening at all? According to facebook, the average user has 130 friends. Imagine if each of those friends donated just $10 to a cause. That’s $1300! And imagine if each of those people asked their friends to donate – and their friends donated that same $10, that would total $169,000! It’s crazy what a simple $10 donation could do. And yes, it’s unlikely that those 130 friends would not overlap. But, that’s not really the point. 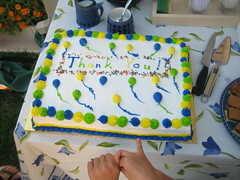 The point is the power of social networks and small donations to help effect change. 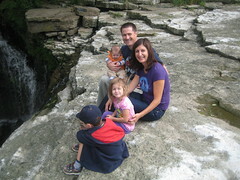 Click here to register to walk with Team Katie on May 29 at Safari Niagara in Stevensville. 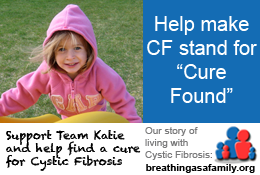 Help us make CF mean “Cure Found”. Great Strides 2010 – join us in fundraising for a cure!